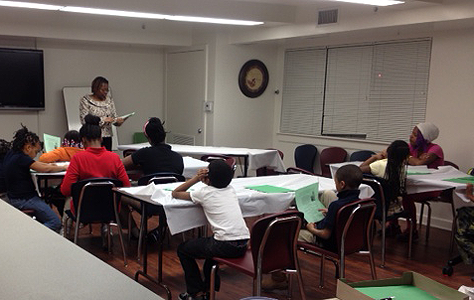 Consumer Action conducted training for the residents of Philadelphia-based Mission First. Philadelphia-based Mission First Housing Group’s mission is to develop and manage affordable, safe and sustainable homes for people in need, with a focus on the vulnerable. The organization ensures that its residents have access to resources to help them live independently. The group delivers housing that provides long-term benefits to residents and neighborhoods alike. Mission First opened its doors in Philadelphia in 1988 as a joint venture between HUD, the City of Philadelphia and the Robert Wood Johnson Foundation. Originally, the agency acquired a building with two units and used it to provide housing for adults with chronic mental illness. Over time, the agency has expanded its reach by acquiring properties in troubled affordable housing projects, employing merger strategies and coordinating resident services. Now the agency provides safe, affordable and sustainable homes to nearly 3,000 people in over 2,000 units. Mission First’s footprint is firmly stamped on the entire Mid-Atlantic region, where it serves a diverse resident population that includes families, veterans, seniors and individuals with disabilities. Mission First’s DC resident services coordinator, Patrick Williams, reached out to Audrey Perrott of Consumer Action’s outreach and training department to see if a Consumer Action staff member could conduct trainings for the residents of Mission First, who are predominately African-American with income levels of 30% of the area’s median income (AMI). The agency provides on-site supportive services in five key areas: 1) health and wellness, 2) youth enrichment, 3) community engagement, 4) education and employment, and 5) resident education. Financial literacy falls under the group’s resident education initiative. Its goal is to improve quality of living standards for residents by providing education about money management skills, building and repairing credit and establishing short- and long-term goals. Community advocates train Mission First clients using Consumer Action's materials, including MoneyWi$e and Digital Dollars. Although the Consumer Action team was unable to conduct the trainings, Perrott arranged for two of Consumer Action’s DC network partners, Azalea Albritton and Idriys Abdullah, to fill in. These community advocates have been trained on MoneyWi$e, Digital Dollars and other Consumer Action educational modules. Albritton is a member of the New Hope Church of God and a certified Educator of Personal Finance® and Certified Personal Finance Counselor®. She works with Pastor Aaron Jones to provide counseling to families receiving benevolence from the church. Albritton is also a volunteer financial counselor with the Maryland Cooperative Extension in Prince George’s County. Albritton conducted the first financial literacy training in Mission First’s series for youth aged 5-13, which covered earning money by doing chores, saving gift money and understanding the difference between needs and wants. She offered examples of chores that would be appropriate for each age group, and provided play money to see if the youth were able to recognize the different denominations. Dividing the play money into sandwich bags, she had the kids break off into smaller groups (a mix of older and younger) and discuss how much money they had in different denominations. Albritton defined needs as essentials, such as clothing, food and transportation. For wants, she gave the examples of toys and candy. Mission First provided food and raffle prizes, including headphones, a movie gift card and a DVD, as incentives. Albritton provided each student with a pen and piggybank donated by CEO Timothy Anderson of the Government Printing Office Federal Credit Union. She also gave away some financial literacy computer games provided to Consumer Action by Visa Inc. Coordinator Williams scheduled financial literacy programming through June for his residents. The U.S. Attorney’s office will present the next session in the series, on financial scams against seniors, on April 2. Albritton will return in April to conduct another presentation for the youth. That session will be followed in May by two MoneyWi$e sessions for adults on saving and budgeting. In June, Idriys Abdullah, consumer protection advocate at the DC Department of Insurance, Securities and Banking, will present the MoneyWi$e modules Good Credit and Rebuilding Good Credit. Williams uses a multidisciplinary approach to reach and educate his residents. The tools include presentations, group activities, games, incentives and one-on-one counseling. He finds that providing incentives such as food and prizes is a major factor in getting residents in the door and opening them up to learning. Editor's note: You can find all of Consumer Action's MoneyWi$e materials on its MoneyWi$e website.